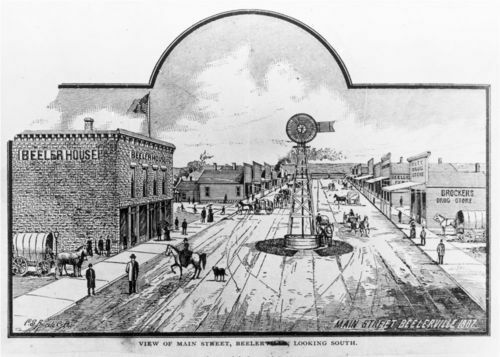 This image from a lithograph shows a view of Main Street looking south in Beeler, Kansas. Brocker's Drug Store is visible on the right side of the picture. The sign on the front of the building reads, "City Drug Store." Several other buildings are visible along the street, including the Beeler House on the left side of the picture. The drawing also shows many people along the street, horse-drawn carriages, covered wagons, and a lady riding a horse. A windmill is in the middle of the street, and there appear to be railroad cars crossing behind the buildings far in the background of the picture. Holding Institution: Mrs. Frank L. Houghton, 1961. Mike Getto, 1967.